Soft tissue and whiplash injuries can be difficult to quantify. You know that you are hurting, but there are no visible or obvious signs of injury. Following an accident, insurance companies are often hesitant to pay compensation for anything short of a broken bone or obvious wound. This response can leave you without the medical treatment you need for relief and recuperation from your injury. 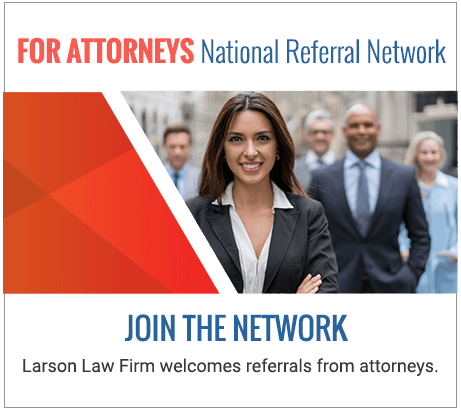 At Larson Law Firm P.C., our knowledgeable North Dakota injury lawyers understand the complexities of a whiplash or soft tissue injury. We have spent more than three decades helping injury victims pursue compensation from those responsible for their injuries. Our legal team works hard to help you get the settlement you need in order to aid with your recovery and help you move forward with your life. If you have been hurt in an accident of any type and are concerned that you may have suffered whiplash or soft tissue damage, we can help. Whiplash is a type of soft tissue injury. It occurs when a person’s neck “whips” forward and then backward. That rapid acceleration-deceleration force usually happens as a result of being rear-ended by another vehicle, but you can develop whiplash on a roller-coaster, while playing certain contact sports, or while engaging in extreme sports like skydiving or bungee jumping. People tend to think of whiplash as a “fake” injury, but nothing could be further from the truth. The pain can radiate from your neck and into your shoulders and your spine, and it can last for months or even years. Some people experience debilitating pain; others find their range of motion is limited, or feel numbness or tingling. Regardless of how you sustained your injury, our lawyers meet with you personally to determine your goals and medical needs. Allow us to focus on getting you full and fair compensation, so you can focus on getting better. Insurance companies often fail to take claims of whiplash and soft tissue injuries seriously. If they do offer you a settlement, it is not likely to be in your best interest. They have numerous lawyers and resources on their side. Don’t try to negotiate alone. Our experienced whiplash injury lawyers have extensive experience in negotiations with all major insurance companies. We have established a reputation as strategic negotiators and skilled litigators. You can rely on us to help you get the maximum amount of compensation possible. If you are experiencing pain following a car accident, first seek medical attention. Then, call the lawyers of Larson law Firm P.C. to explore whether you may be entitled to compensation. Complete our contact form or call 701-484-HURT to schedule a free initial consultation to discuss your case. From our office in Minot, we represent clients throughout Ward, Williams, McKenzie, Pierce and Mountrail Counties.